Will Burrard-Lucas’ professional life is filled with tales as wild as the subjects he photographs—from climbing up a tree to save himself from a black rhinoceros to having a prototype of his invention stolen by lion cubs. British born Burrard-Lucas spent a part of his early years in Tanzania with his family, and it is the countless safaris from those formative years that played a key role in influencing his career path. He decided to become a full-time professional wildlife photographer in 2010. In 2009, he built the first prototype of the BeetleCam, a remote-controlled camera buggy with a hard shell, built to take wide angle, up-close shots of wildlife. 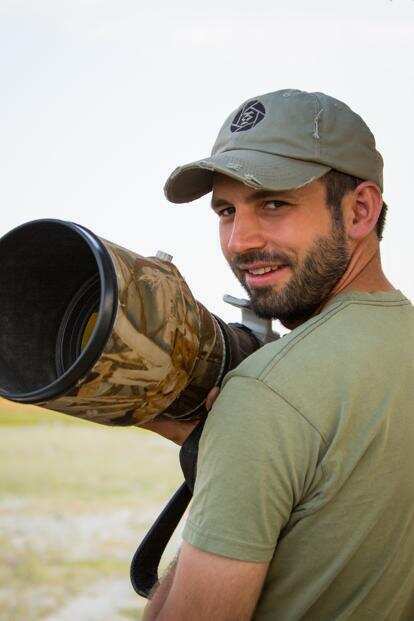 By 2014, he had set up a company called Camtraptions to sell BeetleCams and other camera trap devices globally. He is conscious that his invention brings him in much closer contact with nature and so he ensures he follows certain guidelines while using it. Those rules are probably more important now than ever before. Last month, a viral video of a brown bear mother and cub shot by a drone in Russia raised several questions about the impact such technology can have on wildlife. What kind of tweaks did you have to make to the BeetleCam to ensure it doesn’t startle wildlife? BeetleCam is very slow so it is not possible to chase or surprise wildlife. Instead, the best way to use it is to move it slowly or keep it still and let animals come to investigate the camera if they want. For more sensitive animals, it is best to keep the buggy completely still as the animal approaches so as not to startle it. What is your take on using drones for wildlife photography? Drones are inherently no worse than a human cameraman in a full-sized helicopter or land-based vehicle in terms of wildlife disturbance. In fact, I would say that they are often less obtrusive than other techniques. However, they must be used responsibly and ethically. If a cameraman is working with unfamiliar subjects or in a sensitive situation, then they should team up with a knowledgeable guide, researcher or conservationist who can read the situation and ensure the animal is not being disturbed. Sometimes signs of disturbance are subtle, which is why it is best to work with someone who really understands the animal. How conscious were you of ensuring something similar didn’t happen with the BeetleCam? I am always conscious of this, which is why I seek permission first and work with people who know the subjects intimately. What led to the invention of the BeetleCam? It was that perspective—getting close using wide angle lens is a completely different type of shot. When you’re far away with a long lens, you get a really shallow depth of field so you get amazing behavioural shots and portraits but they’re all of the same out-of-focus background. Getting close, you can see the environment and it’s more about how we experience the world through our own eyes. I look at those photos and I almost feel like I can reach out and touch the animal and I love that. What is the funniest thing you have seen some of your subjects do to the BeetleCam? I always take the viewpoint of letting the animals come to it and do what they want to it. I’m not chasing them or pursuing them, I see what they do to it. Lion cubs, for instance, love playing with it and its quite fun because it’s like playing with your house cats. Often it is not funny at the time because I am worried I am never going to get my camera back. Once, lion cubs stole the BeetleCam and ran off with it, and I had to follow them into the forest to get it back. Fortunately, they didn’t have very good stamina so they carried it and ran away with it, but they were only able to go so far before they dropped it. So as long as you’re able to follow them in the vehicle, you can reach out and pick it up when they drop it. I’ve learnt with lions you have to pick the right circumstance to use it because if you use it anywhere, you’re liable to lose your camera. African elephants are always very cautious and they are very aware of what’s around their feet and if I don’t move it, they’re not scared of it and they just come past it, but if I try and drive it towards them, they will just walk away. And I thought Asian elephants will be the same. I went to Sri Lanka to photograph Asian elephants and I thought they weren’t going to be a threat to the BeetleCam. So I took it out there without a shell, and they were completely different to African elephants. They crowded around it and stomped on it. They completely destroyed my camera! So I learnt the hard way to have some respect for the Asian elephants. What other animals have you worked with? I’ve spent some time with black rhinos in Africa and they’re really grumpy. The moment they know you’re there, they will either run away or they will charge you. If you are following one, you have to be on foot really because they live in the bush and you can’t drive there. And you’ve always got to know which tree you’re going to climb if the rhino discovers you’re there and charges. There are a few projects where I’ve had to run and climb trees really quickly before the rhino caught me. I’m usually with rangers who are always there to help. So to get photos of them, I resorted to camera traps because it was the only way to get close to them. Are there enough avenues today to make a career out of wildlife and nature photography?